As we continue to address the liturgical excesses and overall busyness too often found today, it is important for Catholics to learn how they can more devoutly assist during Mass. In many ways the Church has begun this process by expanding access to the Traditional Latin Mass in recent years. 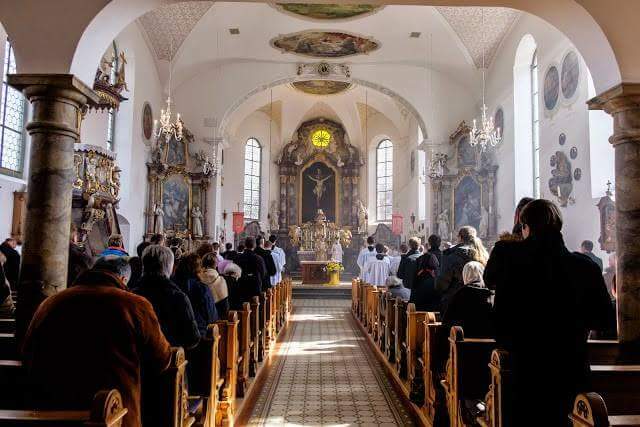 The Extraordinary Form of the Mass, with its more distinct differentiation in roles between priest and faithful, is helping many to gain a better understanding of their participation within the liturgy. 1. Reconstruct the historic setting in which took place the event in our Lord’s Life, or in that of one of His saints which is being commemorated on the appointed day. In doing this much help may be gained from the Mass of the Catechumens with its different features: the vestments, the chant, the Introit, Epistle, Gospel, etc. 2. Offer to God, for His greater glory, the mystery of our Redeemer’s life which is being commemorated, or the acts of virtue which have been practised by the saint whose feast it is. This is done in the Canon of the Mass; it is not fitting to communicate before having made this offering which appeased the most High and brings us divine grace. 3. Ask of God (this is done in the Pater noster) and receive from Him by the merits and intercession of our Lord and His saints, the graces which they themselves received when they were living on earth. 4. To these three ways of interior or spiritual participation, which can be practiced at every Mass, we should, as far as circumstances allow, add exterior or material participation, which may consist: In reading liturgical prayers with the priest, in singing congregational and Gregorian chant at High Mass, in responding aloud at Low Mass, and best of all, in receiving Holy Communion with the priest during Mass. In this way we shall draw plentiful fresh draughts of the true Christian spirit at its primary source as Pius X wished. As Holy Mother Church begins a new liturgical year soon, may we make it our resolution to more devoutly assist at Mass through our attentive participation. In addition, may we help others better understand how they can more actively enter into the Mass by introducing them to Dom Lefebvre’s recommendations. Posted on November 22, 2015, in liturgy and tagged active participation, assisting at mass, cardinal ranjith, Dom Gaspar Lefebvre, Saint Andrew Daily Missal. Bookmark the permalink. 1 Comment. Thank you for these inspiring quotes…reminders of the greatness of Mass!